This Hawai’i helicopter tour puts Big Island’s entirety on display. Yes, the full island is covered in an amazing two hour flight! They don’t call it Big Island for nothing! There’s a whole world here to discover and if you want to see all of it, a helicopter ride is the only way to go! 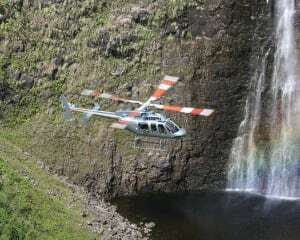 This Hawai’i helicopter tour puts Big Island’s entirety on display. Yes, the full island is covered in an amazing two hour flight! Valleys that drop 2,000 feet, waterfalls towering to the heavens, sandy beaches that pop out in shades of white, black and even green—the environment here is one of the most versatile on earth. In fact, you’ll travel 11 of the planet’s 13 climate zones! The Bell 407 helicopter features two-way communication with your pilot, which makes the whole flight wonderfully informative! From Kona Airport, travel past the Kona coffee district and see the stunning Mauna Loa. Get great views of Punalu’u (the most southern city in America). Move on to the Papakolea crater with its flowing lava. Go eastward and take in historic Hilo town. See ancient lava passages where water now flows. Admire the sharp cliffs and sandy beaches of all shades. Capture photos of the hundreds of waterfalls dotting the island. This is the only helicopter flight in Hawai’i offering such a sprawling trip. If you want to absorb as much of the island as possible, there’s no other way to do it!